(WASHINGTON)—The American Road & Transportation Builders Association’s (ARTBA) Transportation Investment Advocacy Center ™ (TIAC) will host its 4th Annual “National Workshop for State & Local Transportation Advocates” July 12 at the Hyatt Regency on Capitol Hill. The event brings together more than 100 transportation professionals, chamber of commerce executives and state officials to share best practices, playbook secrets and other keys to success in advancing state and local legislative and ballot initiatives that boost infrastructure investment. WHERE: Hyatt Regency Washington, Columbia Ballroom, 400 New Jersey Ave. N.W. 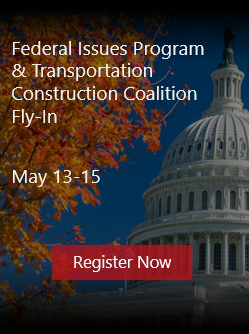 See the full program schedule at www.transportationinvestment.org/state-funding-advocacy-workshop/workshops/. Members of the news media wishing to attend the event should contact ARTBA’s Eileen Houlihan at ehoulihan@artba.org or 202.683.1019.